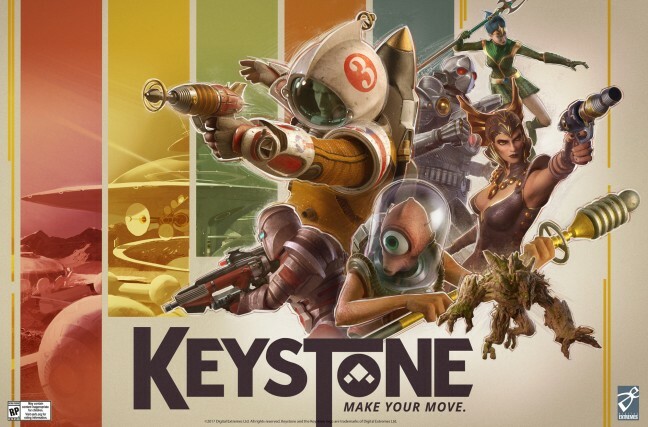 Keystone is an intriguing new blend of first person shooting, board gaming and deck building set in a stylish retro-pulp 1970’s era and being developed by Digital Extremes, creator of Warframe. There’s very little in the way of hard gameplay details and no in-game footage or screenshots available, but Digital Extremes certainly know how to do competitive shooters, and the mash up of genres is very interesting. It will take players on a journey through a multiverse that starts within a mystical board game. During matches players will be able to use decks of cards that will offer powers, weapons and perks to get the edge on their opponents. It’s an novel premise, that seems to take Titanfall’s card system and make it more integral to the gameplay – a game where first person shooting skill and deck building strategy are equally important in winning matches. The first wave of testing starts on the 26th of may, so sign up quick to discover more about this intriguing collectible card shooter.